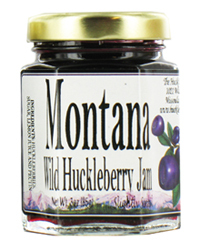 Brimming with fruits, the Wild Huckleberry jam is our best selling flavor. This 5 oz jar is a customer favorite because it can be reused as a salt or pepper shaker. Don't forget to try our other delectable wild berry flavors. 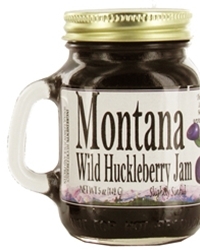 The 13oz jam is our biggest jar, and filled to the brim with wild huckleberries for the true Wild Huckleberry jam lovers. This product is also among one of our customers favorite as the jar can be used as a coffee mug. 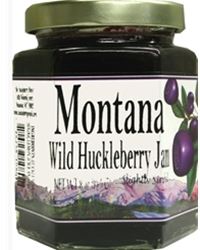 A wide variety of other wild berry flavors are also available. 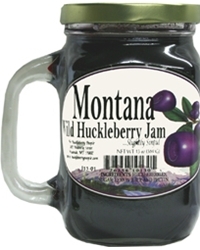 The 8 oz jam is our third most popular jam size. Available in 10 flavors, this beautiful hexagone shaped jar makes a perfect gift for any occasion. 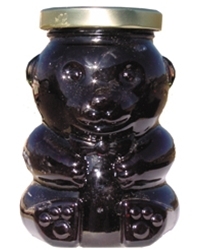 This 12.6 oz bear shaped jar is probably our cutest container, and it is absolutely packed with wild huckleberries. 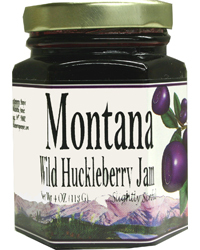 Also available in our huckleberry raspberry blend. Our smallest jam size available. 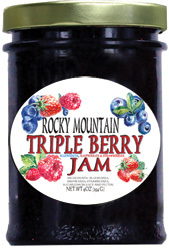 The 3 oz jam is the perfect choice for those who want to have a different jam flavor every morning of the week. 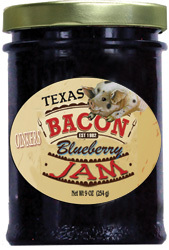 Our 9 oz Bacon Blueberry Jam will delight any sweet and salty jam lovers. Our 9 oz Triple Berry Jam is a delicious mix of Blueberries, Raspberries, and Strawberries for a taste that will leave you wanting more.